A mum in the UK fails to read an email telling her she is a millionaire for three weeks. A Salem, Oregon couple won a record setting $6.8 million Mega Bucks jackpot. Gurnee resident Dave Martinez has made a trip many of us aspire for. On his 60th birthday on the 21st of November, he took a trip to the offices of the Illinois Lottery to claim a $2 million instant ticket prize. 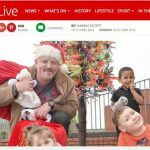 This early lots of kids have already tasted a bit of Christmas cheer as a lottery-winning bin man helped distribute gifts to 120 of them at the Lagan Village Youth & Community Centre. A man working as a custodian at New Trier High School is all smiles after winning enough money to retire on. 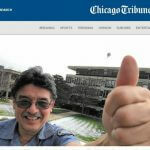 Dave Martinez has been working at various campuses of the New Trier High School since 1982, where he is well-loved by students and staff alike, and who affectionately call him “Speedy.” His main job is to conduct traffic in the morning and afternoon and to help set-up ball games. It is that time of the year again, and I don’t just when Santa spins up his sleigh. It’s also time for the Spanish El Gordo mega-draw. Belinda Poblete and her husband Ramon were living in a modest two-story home in Rockland County with her parents when their their financial fortunes suddenly changed. 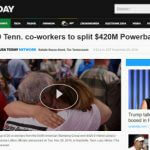 A whole bunch of people from Tennessee and Kentucky are going to have a very Merry Christmas this year, thanks to a Powerball Lottery syndicate. 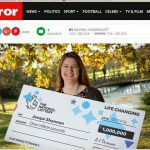 This week a man just received 2 million reasons to be thankful just after Thanksgiving and a UK mom who plays online snagged a hefty million pound payout. A charity worker needlessly worried for about financial matters for three weeks just because she couldn’t be bothered to check her emails. Mum-of-one Jacqui Shannon was actually worried about having her old car pass MOT registration requirements. Angela and Brian Feiring bought lotto tickets for the same reasons most of us do – hoping to win big bucks. The pair always made it a point to buy quick picks, perhaps knowing that the odds remain the same whatever number combination you choose.